Due to a degenerative eye disease, I live with basically one eye. You wouldn’t know it looking at me, but an ophthalmologist explained to me that my left eye has reached the point where my brain doesn’t rely on it any more. What I see basically comes through my right eye. I write with “one eye” too. I’m a “spiritual” writer, steeped in the Christian classics, theology, and decades of studying Scripture. When I address marriage, it’s automatic for me to view it through that one lens. Debra Fileta writes with two eyes. She has an uncanny “spiritual” awareness. By that I mean she understands not just biblical truth, but also biblical sense. Added to that, however, her other “eye” is the eye of a trained marriage therapist. She has worked successfully with numerous couples, and can see patterns that “thinkers” who often write in book-paneled rooms might miss. 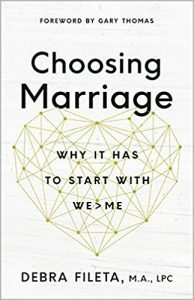 Her newest (upcoming book available for pre-order) “Choosing Marriage” is a marvelous way to describe, in just two words, the spirituality of marital commitment. The phrase itself is loaded with profound theological meaning and provides a helpful metaphor. But Debra doesn’t stop there. She offers numerous tools to make choosing marriage seem possible and practical. In other words, Debra doesn’t just inspire us—plenty of “spiritual” writers do that; she also equips us. Rare is the writer who lives in both worlds so effectively. If you find yourself dealing with one or more of the following issues in your marriage, it’s time to take seriously the suggestion that your marriage needs attention. 12. If you find that you’re filled with more bitterness toward your spouse than affection – your marriage needs attention. 11. If you find yourself arguing with one another more than connecting with one another – your marriage needs attention. 10. If your disagreements constantly escalate, and end in more conflict rather than a resolution – your marriage needs attention. 9. If you find yourselves passing each other like “strangers” rather than interacting as friends – your marriage needs attention. 8. If you commonly go through your day without touching or connecting physically – your marriage needs attention. 7. If, more often than not, you feel more emotionally drained after being together rather than emotionally filled – your marriage needs attention. 6. If you never have disagreements. Ever. Ever. Ever. – your marriage needs attention. (This tells me that real needs and desires aren’t being expressed on a regular basis and that passivity or safety need to be explored). 5. If you’re so busy or distracted that you have less than 30 minutes of quality conversation in your week – your marriage needs attention. 4. If you feel disconnected and not “in tune” with one another spiritually and emotionally – your marriage needs attention. 3. If you have unresolved issues from the past that keep coming up to haunt your relationship in the present – your marriage needs attention. 2. If you are clueless about your spouse’s activities, interactions, and behaviors when you’re not around – your marriage needs attention. 1. If you would rather spend your free time with people other than your spouse – your marriage needs attention. It’s time to get serious about getting your marriage to a better place. 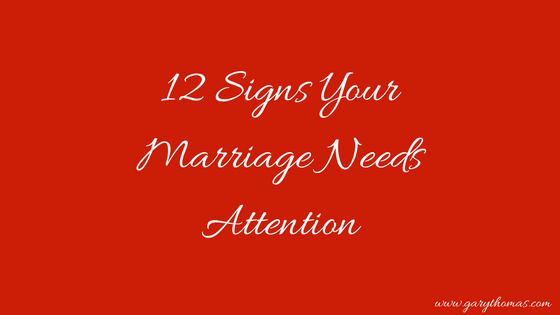 It’s time to be deliberate about giving your marriage the attention it deserves. Because attention breathes life into a marriage. If you want practical steps, detailed advice, and a candid look into what it means to invest in your marriage and take it to a better place, check out my new book, Choosing Marriage. It’s filled with astonishing survey results from over 1,000 married people. I poured my heart and soul into it, and I believe it’s going to change marriages and relationships across the globe…one choice at a time. Comment below: What are some ways you give “attention” to your marriage? Debra Fileta is a Professional Counselor, national speaker, relationship expert, and author of True Love Dates: Your Indispensable Guide to Finding the Love of Your Life, where she writes candidly about dating, relationships, and how to find true love. Her newest book, Choosing Marriage, is set to be released in the Summer of 2018! You may also recognize her voice from her 200+ articles at Relevant Magazine, Crosswalk.com, and all over the web! She’s the creator of this True Love Dates Blog, reaching millions of people with the message that healthy people make healthy relationships! Connect with her on Facebook or Twitter or book a session with her today! I met my wife 10 years ago, been married 5 years – it’s never easy being with someone for that long and we have had our fair share of ups and downs. The reason we always get through the hard periods is because we have the utmost respect for one another. I am sorry, But your Articles and writing seem to be very female-centric. i stumbled across your help for christian families struggling with pain and hurt and your examples, articles, and reflection seem unfairly biased toward women, laced with assumptions that they are not equally a part of causing the pain or confusion in the very messed up world of relationships we live in. This is just some honest feedback based on what I’ve seen and would hope you consider (just consider-please) holding women equally accountable for the pain that happens in relationships without coddling them as if they are more often victims- they are not. While you may know this to be the truth, which I would assume you do, because you are extremely good at giving advice, and I do believe you have helped thousands with their relationships, I would just hope and offer my slight advice and observation, that men, are possibly not getting nearly enough healing, or clarity in advice and interaction out of your writing as you might think, possibly because of an underlying skew in thinking, or reach in writing capability. I believe there is untapped potential there in your helping mend and heal relationships and hurting couples. (i.e. for reference your article entitled “What you need to change when your spouse doesn’t). Just my two cents! Blessings and Peace to you! Thanks for this constructive feedback. You’re earnest and sincere and I believe the words are offered in good faith. And there’s a ring of truth in them, to be honest. I think I do tend to be a bit harder on men than women. The percentage of spouses who come to me with grievances are perhaps 80 to 90 percent women, so when you use stories based on real-life examples, those stories pop into my mind first. Pay attention to the next post, just about to drop: “The Bubble Busting Spouse.” That’s one that challenges a wife. The three posts following that one will be based on my book “Loving Him Well,” which aims at helping women have empathy for the way a man thinks and processes information (as well as relational intimacy). I’m grateful you’re a reader here and for providing this feedback. If you think I still hold this bias in another couple months, please feel free to keep holding my feet to the fire! Thank you! Answered “yes” to 7 or 8 of those. We have been married 26 years, 9 children. We’ve been through a lot, including infidelity. I have read several of your books, as well as others. Some we have read together. Have been to counseling. How do you get a spouse to put into practice what counselors and books suggest? He says he wants the marriage to work, but sometimes it doesn’t feel like it. It takes two (plus God) to make it work. More prayer? More patience? 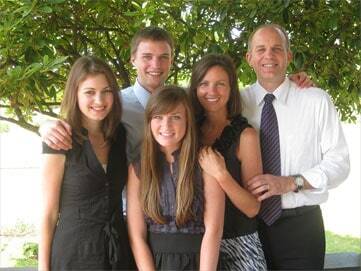 I get really frustrated when I think about the example we are setting for our kids, who are not so little anymore. Our youngest is nine. It is affecting them, too. I so long for that marriage you talk about in your books. Thans! Thank you for sharing this and for the reminder to pay attention to our marriage, every day. My husband and I try to be intentional about reading through different books together. We’ll read through a book at our own pace, and then touch base about things we noticed about it. We do this for marriage books and other books. It helps us feel connected and gives us a common language. For myself, I try to do a lot of little things every day. I try to say thank you for everything he does, even the small things. I also keep in mind a John Gottman article about bids that I read a while back, with bids being all the ways you emotionally turn toward your partner for connection. I keep that in the back of my mind often when my husband talks to me or we do things together. I look at him when he talks, and engage in the conversation, even if it’s something I’m not personally invested in. We both strive to be very open and honest with each other, and have made a pact that we can always trust what the other person is saying. No reading between the lines needed. This can be tough at times, and we’ve had to apologize to one another for misspeaking on occasion (especially me! ), but it keeps the air very clear. If he says nothing is wrong, I trust what he says. And if I tell him I’m okay making dinner alone, I’m telling the truth. It’s such a relief to me to be able to trust what my husband is saying and to KNOW he is not hinting at anything. And I’m pretty sure it’s a relief for him, too! 🙂 We’re still in the newlywed phase, but both of us want to spend these first few years forming good habits and a solid foundation. Life won’t always be as “newlywed” or uncomplicated as it is now. I’m not under any illusions that it will be easy to turn toward each other always. But I do believe some of the choices we’re making now will make a big difference as we move forward. This book is one I just get. It highlights just how sad our marriage is. After 10 years of praying, trying to please God and live how he would like me to live as a wife to his son, nd reading many books on how to change me. Our marriage is still lonely and shallow as my husband doesn’t seem to want emotional or spiritual intimacy only physical. I’m hoping this book may throw more light on what to do. Thank you. If it’s not safe to talk about things…then how can you ever talk about them? Or you’ve talked about them endlessly, both are tired & done… and it becomes unsafe to talk. There is no way out. Gary- I would answer “yes” to 11 out of 12 He would too but says he will just live with me and take care of me. No hope for better marriage in his mind-he hasn’t been seeking God for the past 8 years or so. He admitted to an affair 3 years ago and I have stayed out of fear and for the kids But I have drawn so close to Jesus! He has been my comfort my joy my strength and I am so thankful for the “wake up call”. I repeatedly try to fix this myself through lots of arguing for him to see hope but he’s gone to counseling with me to a Christian counselor who has let him blame me for 90% of our problems and I feel he was never challenged. So I would so love to send him this email. He is kind to me but no affection and he is trying to build my trust. Any ideas? This list of twelve perfectly describes my first (abusive) marriage. What’s different in my second marriage? CHERISHING. Cherishing is the answer to almost every single difficulty on this list. Gary, my husband and I thank God that we discovered your book and started reading it together before we even got married. It has set the tone for our marriage. For us, it’s taking each other’s bids (showing interest and attention), daily talks about our day, and small touches throughout the day that keep us intimately physically connected. I am so thankful that God gave me a second chance to love and be loved!